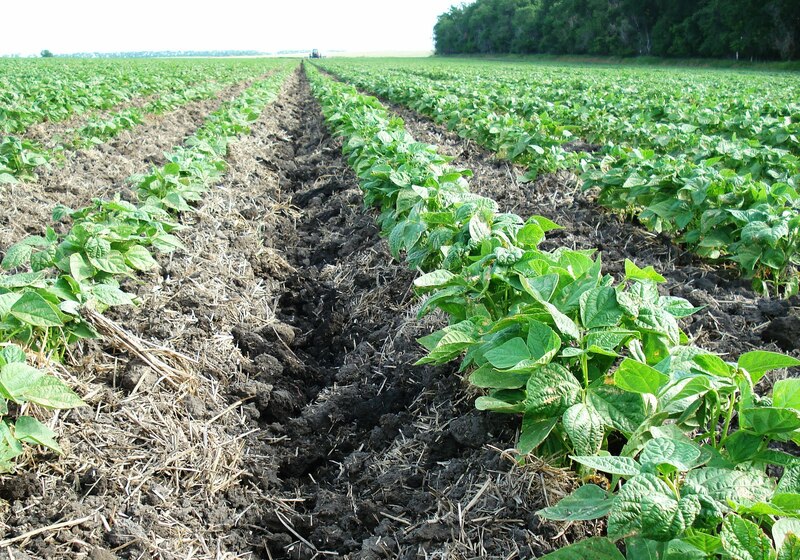 Above: AdFarm's pinto beans have been cultivated for the second time. Above: Remember where Jim got stuck in the mud while planting? The ground is still rough from it, and the cultivator's shank broke at its connection when Bill tried to go over the area. 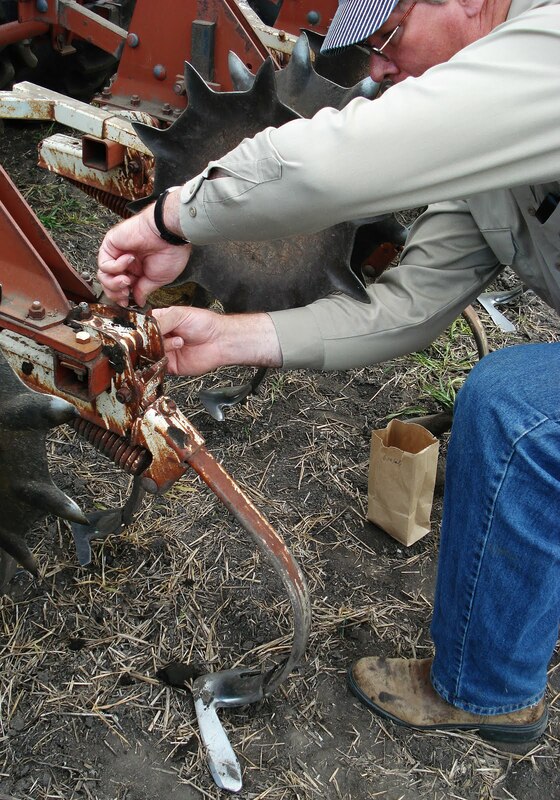 Above: Farmer Fred and Bill work to reattach the shank to the cultivator with new bolts. Above: A close-up view of Fred securing the bolts to reconnect the shank assembly. 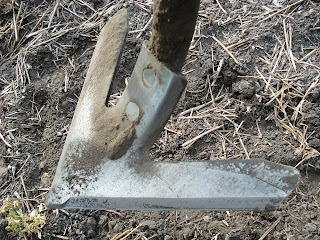 Above: The shovel is attached to the bottom of the shank. 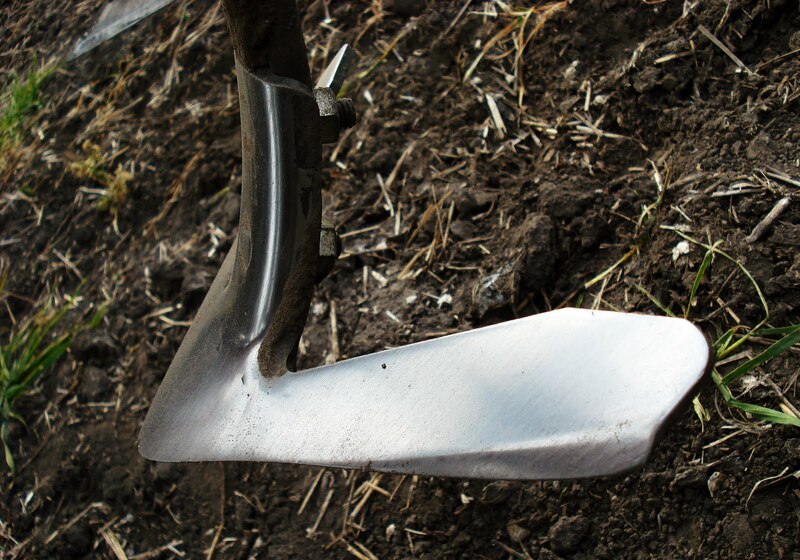 A new shovel, like the one above, cuts through the ground with it's sharp edges. Above: This shovel was new at the beginning of the year. The wear is easily visible. 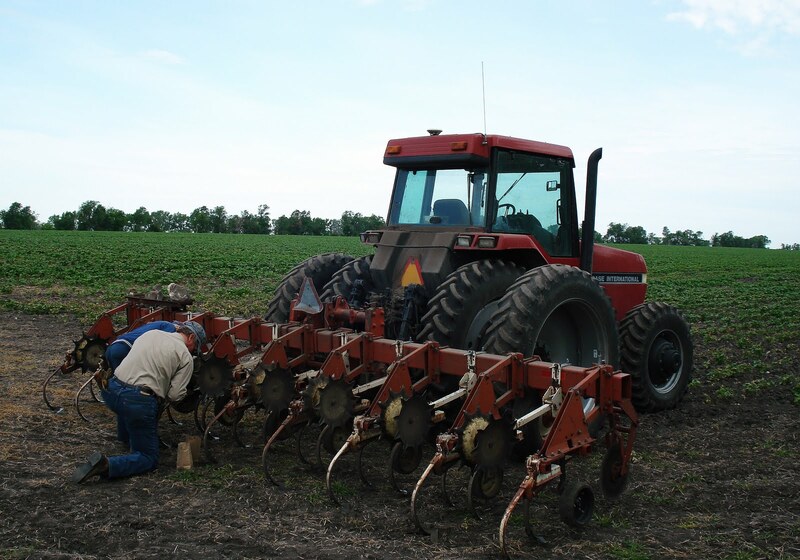 Cultivator shovels are normally replaced annually. 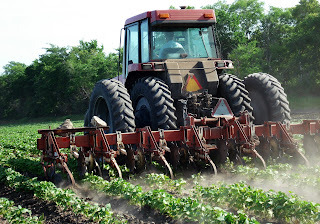 Above: The ground is dry, making dust fly behind the cultivator. 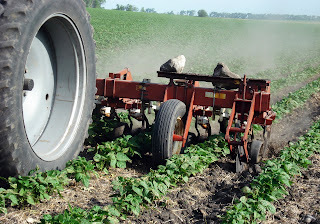 Two rocks that Bill has picked from the field sit in the cultivator's basket. The rocks are removed because they are large enough to cause problems during harvest. 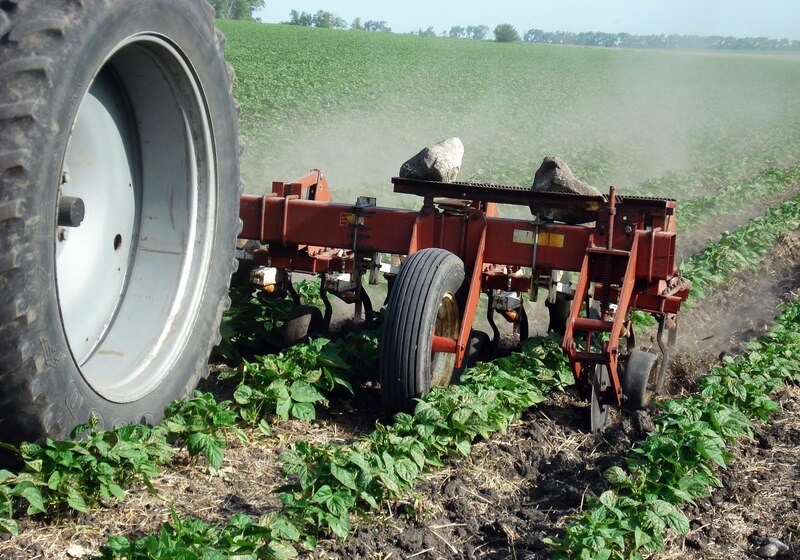 Above: When the field was cultivated the first time, the rolling shields were down to protect the plants. Now, the plants are large enough to withstand having the dirt pile at their bases. The shields are left up, out of the way. 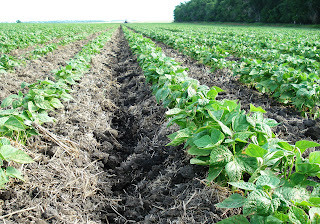 Above: There are two reasons why we cultivate the pinto beans a second time: to create ridges and kill weeds. 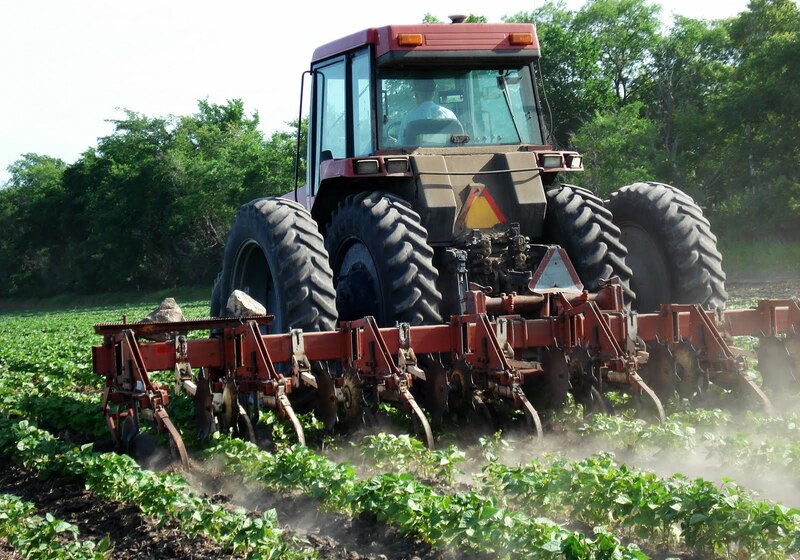 The ridges between the rows help when picking up the plants during harvest. Cultivation also gets rid of any weeds between the rows. 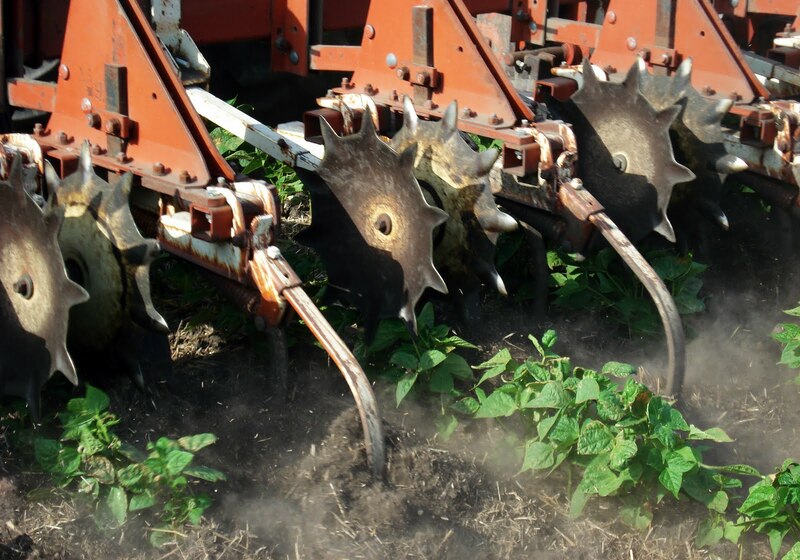 The upturned dirt that piles next to the plants covers and kills small weeds in the row. Above: The yellow and brown on the pinto bean leaves is an effect of the last pass of spray. Research on this same type of spray on soybeans shows that often times, with the right environmental conditions, the plants will bounce back even more vigorous than before. 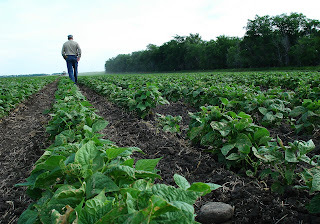 Above: Fred walks between the rows of beans, inspecting the crop. 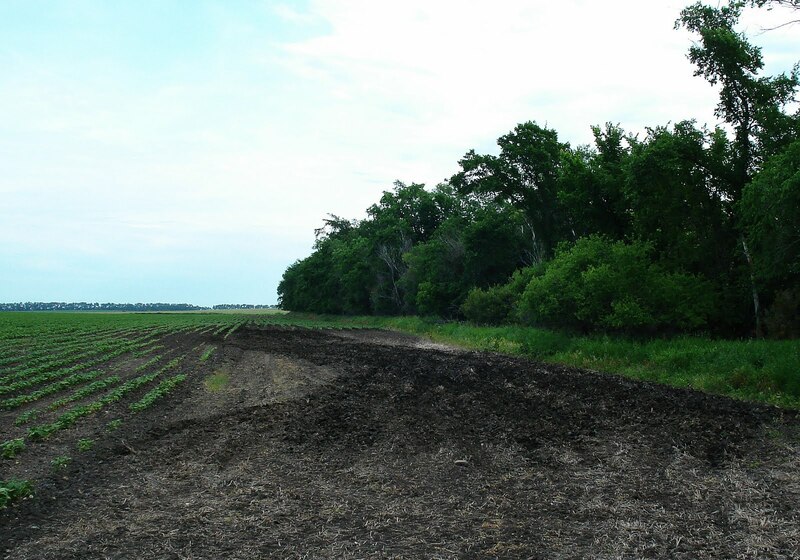 Above: The ridges created from cultivating are visible. Note the darker color of the soil in the lowest point of the ridge. 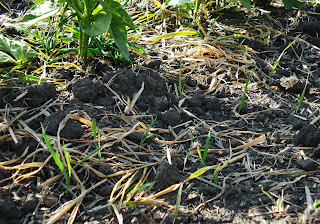 The soil is moist about an inch under the ground's surface, a good sign considering our dry days. 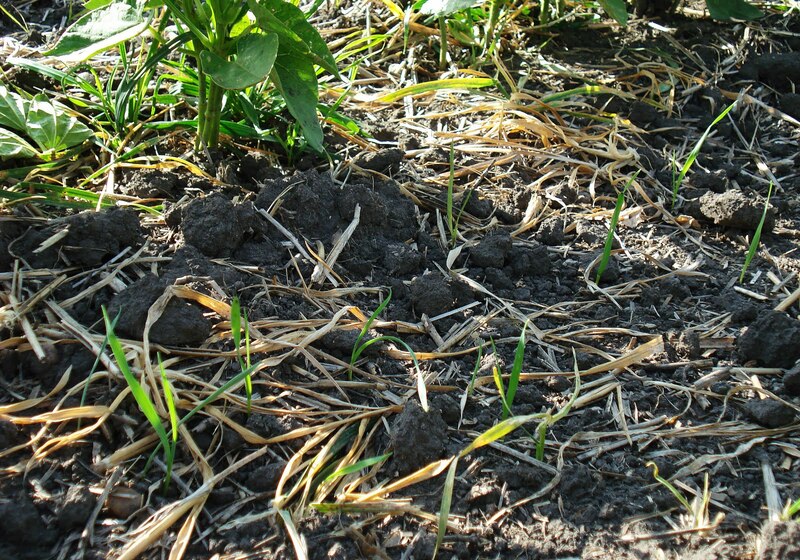 Above: The volunteer wheat that is sprouting in between the rows will be killed with cultivation. 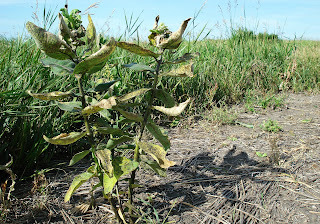 Above: This milkweed plant is on the headland of the field. 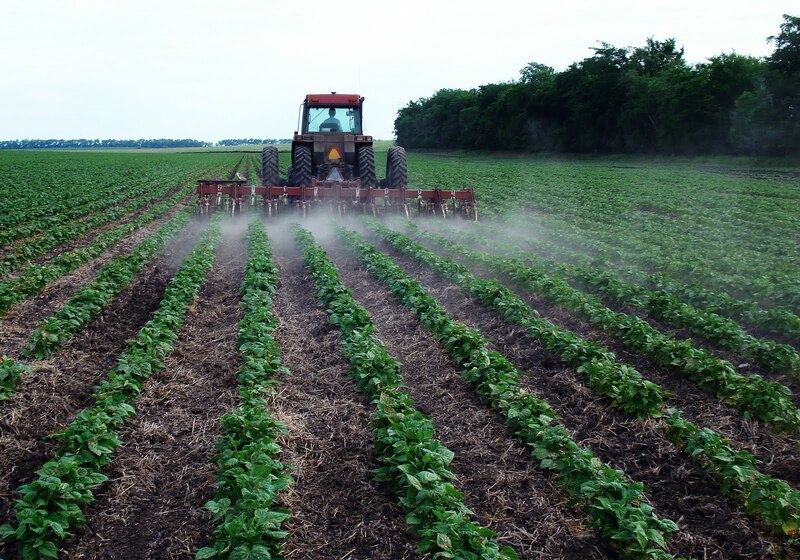 (Note: The headland is the unplanted space at the end of the field used by tractors to turn around.) 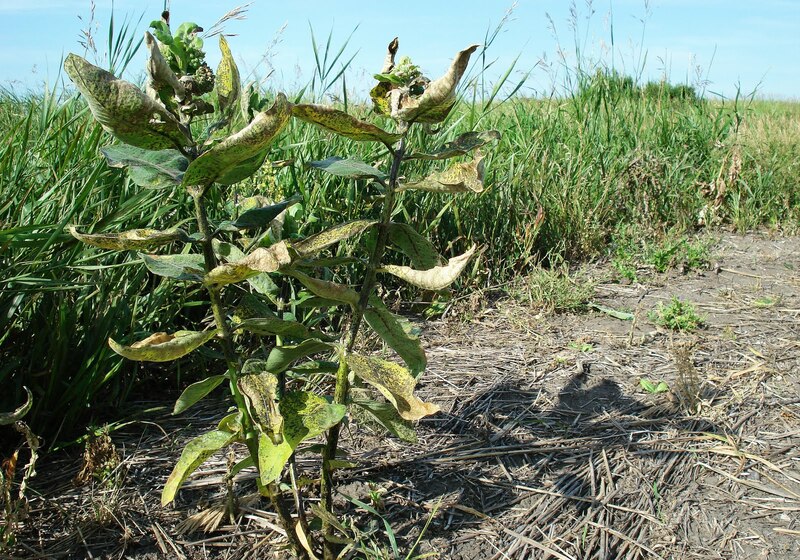 Though the plant is sick from being sprayed, it will recover. 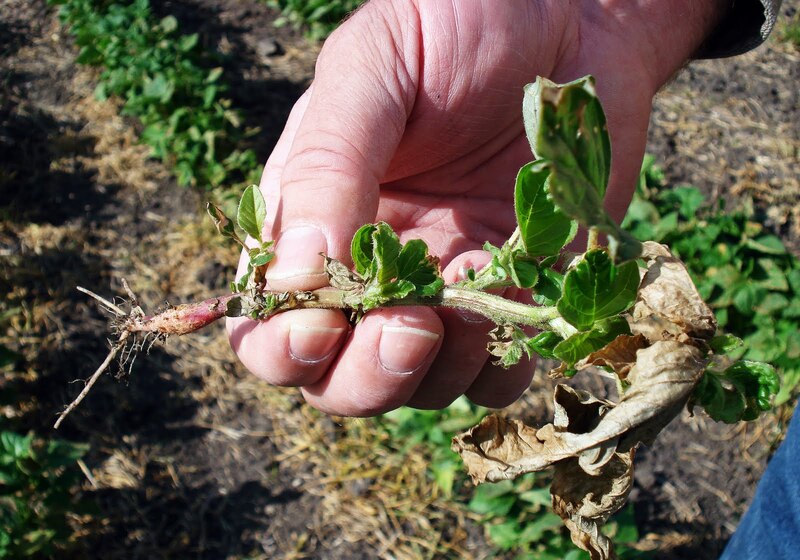 This illustrates why digging up weeds during cultivation is important in pinto bean fields. 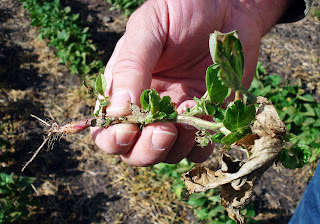 Above: Fred holds a red-root pigweed after pulling it. 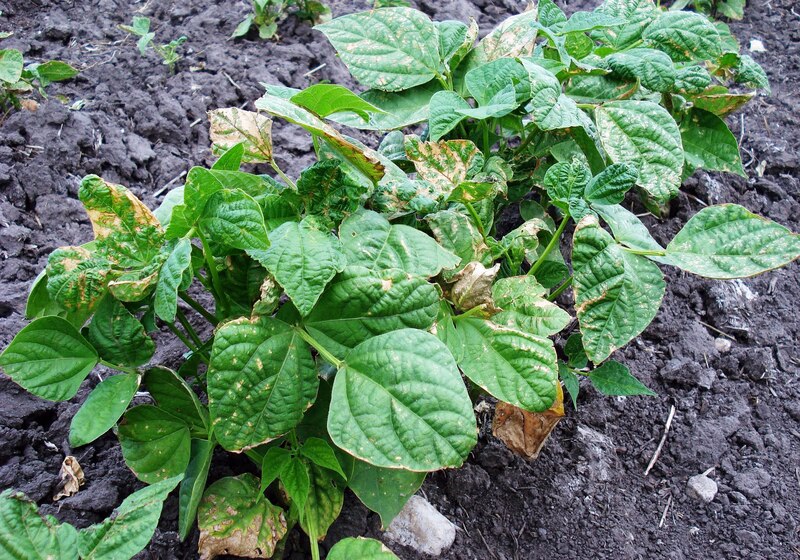 Though this plant is also sick, it too would live on if not cultivated.